How do you talk about a story without revealing the ending? This was a particularly difficult question for Mclean's John Geddes as he engaged Craig Davidson and Iain Reid in conversation on Monday evening. Both Davidson and Reid have written tension-filled, propulsive stories that build toward revelations which change the reader’s understanding of their respective narratives. Geddes handled the discussion well, building the audience’s interest without revealing any spoilers. Craig Davidson opened the evening with a reading from his new novel, The Saturday Night Ghost Club. The passages which Davidson had selected showcased the strengths of his book, especially its narrative tension and profound sense of place. Memory – its malleability and fallibility and, most of all, its power – lies at the heart of this book. Davidson’s well-chosen passages immersed the audience into his narrator’s past. Iain Reid read from the opening of his new novel, Foe. The tension and unease that run through much of the book were evident in his reading. Immediately, the audience was introduced to the main characters, Junior and Hen, whose marriage is the centre of the story. For those in the audience that hadn’t yet read the book, this small taste surely left them wanting to know more. So what can you talk about then, if you can’t talk about plot? Well, quite a lot, actually. Both Davidson and Reid discussed their approach the writing process. Davidson talked about the evolution of his narrator. In the finished book, the narrator, Jake, is a brain surgeon but in the first drafts he was “just Jake.” As Davidson’s fascination with surgeons and the brain deepened during his research, he decided that the protagonist of The Saturday Night Ghost Club would be a neurosurgeon. Reid talked of how he had started Foe from a single image of a rural couple living in separate rooms. He wrote his way into the story, using no outline. There is lot of common ground for these writers. Davidson’s first book, the short story collection Rust and Bone, was made into a film and both of Reid’s novels will find their way onto the screen. (The screen version of I’m Thinking of Ending Things, Reid’s first novel, will be written and directed by Charlie Kaufman. Foe was optioned for film before it was even published.) Both Davidson and Reid view the film versions of their work as happy surprises. As pleased as they each are to have their writing translated to film, neither writer tries to exert creative control over the movie versions of their books. Geddes, Davidson and Reed were pleasingly at ease with each other and each author’s adept anecdote delivery made the hour on stage move quickly. Want to know what happens in these books? Better get a copy! 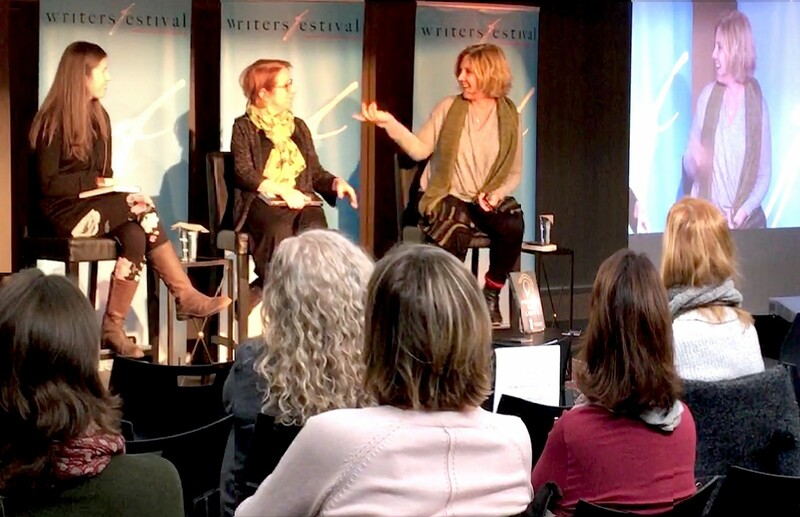 Last Sunday night, in a warm conversation led by Peter Robb of Artsfile, Alix Hawley and Natalie Morrill shared wisdom that their writing has helped them to uncover. (Wayne Grady was unfortunately unable to share the stage and to discuss his most recent novel Up from Freedom because of a family bout of flu). Both Morrill and Hawley traced their novel’s conception to images from their own childhoods. Morrill remembered being lifted by her parents to see overtop a glass shard lined cement wall in Vienna. Suspended and held there for a few moments, she saw the neglected and overgrown Wahring Cemetery, an eighteenth-century Jewish burial ground. That memory stayed with her as she grew up and came to understand why descendents were not caring for their ancestors’ graves, ultimately laying the groundwork for her first novel, The Ghost Keeper. After completing her short story collection, The Old Familiar (2008), Alix Hawley found herself remembering a pen-and-ink drawing of a man carrying his son’s bleeding body. The desire to identify that image, as well as help from a librarian, brought Hawley to the drawing she remembered in a National Geographic article about Daniel Boone. The image of Boone with his son inspired both Hawley’s first novel, All True Not a Lie in It (2015) and this year's sequel, My Name is a Knife. The mysterious pull of those remembered images fueled the creative process for both authors. As they heard and answered the image’s questions through both research and imagination, their narratives unfolded. Both authors read aloud from their works during the evening’s presentation. Morrill had a selected a passage where her protagonist Josef watches and cares for a stealthy fox which moves about the graveyard. Hawley read a section from All True Not a Lie in It which describes Daniel Boone coming home to his wife in the dark. In each of the readings, it was easy to sense the authors’ search for the humanity that lives inside their stories, perhaps inside every story, including those unfolding in our present world. In Morrill’s selection from The Ghost Keeper, a man tries to make sense of himself and of his and his people’s past. Morrill’s character Josef stands transfixed by the complexity of the story he wishes to tell, knowing there is not one single path or person to follow in telling it with justice. According to Morrill, Josef is presented in keeping with Emily Dickinson’s advice to “tell the truth/ but tell it slant.” Morrill gives Josef a second voice, a third-person narrator, to help him tell his story. Hawley too explores truth in complexity “from the side” by giving both Daniel Boone and his wife Rebecca a voice to tell the story of their lives together. In Hawley’s selected passage, the audience heard a woman trying to make sense of both her husband and of herself. Both Morrill and Hawley spoke of knowing instinctively that stories and characters have something to teach us as readers when we enter fictional worlds to seek truth. Hawley suggested that the novelist’s job is to take what can be known through research and to fill in the holes, or to “imagine ourselves in the gaps.” Morrill spoke of a “huge responsibility to be faithful to the facts,” as well as of the need to imagine oneself in the world of a real person. For both writers, thoughtful historical research always guides the creation of a character’s experience. Hawley discussed her need to “confront the ugliness” in her novel’s time period, while Morrill stressed her desire to shine light on both humanity and tragedy during the 1930s and 40s. In their readings and in discussion, both Natalie Morrill and Alix Hawley illustrated the importance of reading with empathy, understanding complexity, as well as the duty of combining imagination with truth, fairness and respect. Mothers are strong influences on the page, as in life—that’s one of the striking similarities between the memoirs by Darrel J. McLeod, the author of Mamaskatch: A Cree Coming of Age and Tom Wilson, the author of Beautiful Scars: Steeltown Secrets, Mohawk Skywalkers and the Road Home. McLeod’s mother, Bertha, had a personality larger than life. “She was the most doting mother,” McLeod remembered, referring to his early childhood. Later, home life grew chaotic and unstable, as his mother took up drinking. McLeod’s mother was a residential school survivor who managed to hold tight to her Cree heritage. In turn, she instilled a deep sense of cultural pride in McLeod. Meanwhile, Tom Wilson writes about his two mothers in Beautiful Scars. There’s the only mother he’d ever known, Bunny Wilson, who would turn out to be his adoptive mother. And then there’s his cousin, Janie Lazare, who would turn out to be his biological mother (or as Wilson lovingly refers to her—his “cousin-mother”). The discovery of his complex parentage also sheds light on Wilson’s Mohawk roots, which ran in deep contrast to his “Steeltown” Hamilton upbringing. When Wilson started his book, he was angry with both mothers and his adoptive father too. However, the process of writing Beautiful Scars allowed him to channel his anger and move past it. As he told the audience, his negative feelings began to dissolve as he wrote. “The love that I had . . . started to come out. It was completely freeing. And it allowed me to write honestly and truthfully,” observed Wilson. It also saved him hundreds of thousands of dollars in therapy, he joked. McLeod echoed Wilson’s reference to psychiatry —he’d already spent tens of thousands of dollars on therapy before he had started Mamaskatch. Thankfully, McLeod’s therapy enabled him to begin his book as a labour of love. Indeed, McLeod wrote Mamaskatch to help those like him, who have endured trauma. “I didn’t want to mask the challenges and the hurt and the trauma I went through,” said McLeod. The reading McLeod shared was raw with emotion and humanity. Seamlessly interweaving English and French dialogue, he read aloud a passage from Mamaskatch in which he was a young man working as an orderly and psychiatric worker. It was particularly moving to hear of McLeod’s experience with Philippe, a psychiatric patient who had been placed on suicide watch after surviving gunshot wound to the head. In the exchange with Philippe, McLeod related the story of his sister, Debbie, who committed suicide. Later, the audience learns that three of McLeod’s siblings committed suicide. The McLeod family tragedy magnifies a national crisis: the suicide rate of Indigenous people is four times that of non-Indigenous people in Canada. Unquestionably, these memoirs both delivered on their promise of revealing intimate details about the authors, their lives and families. For Wilson, the discovery of his adoptive history outlined in his memoir was preceded by sharing his family secret on CBC radio. Penguin Random House Canada reached out to the three-time Juno-winning Canadian musician to write his memoir after the broadcast. Wilson’s first reaction was to say no. How would he write 70,000 words when, as a musician, he was accustomed to communicating in three verses and a chorus? “That’s like going from a Fiat to a Cadillac Escalade,” noted Wilson. But Wilson brought his lyrical talent to the page, interweaving poetry with narrative. True to form, Wilson read and sang during the OIWF and Ottawa Public Library-sponsored event. At their most basic, memoirs are life stories. But sometimes, memoirs are a glimpse into more life yet still to live. “The book is a journey I’m still on—the story is in complete motion right now,” says Wilson. Other times, memoirs have a life of their own before an author breathes them new life on the page. “It was giving life to something that already existed. I was just the channel,” says McLeod of his memoir, a finalist for the 2018 Governor General's Literary Awards. It took up the better part of six years to complete, but after two years he knew he had something special. “How did you break free?” That’s the final question of the night to Vivek Shraya, the author of I’m Afraid of Men. Where was her book when he was making his transition, the audience-member wonders aloud, acknowledging he has transitioned into a “safe version” of himself, one the world around him could, perhaps, more readily accept. Hand over her heart as the audience member poses that question, Shraya is visibly moved. And the room is too – we are collectively quiet and concerned. “Own the parts of you that you don’t want to sacrifice for either side,” Shraya offers. As a gender nonconformist, she draws attention to her unshaven legs. “I love my hairy legs and chest,” she adds before offering a cautionary closing message to the crowd. We can all be complicit in policing ourselves or others, she offers, but we don’t have to buy into the so-called gender rules. So why do we do it then? Why do we create expectations for ourselves and others of what it means to be a man, woman, masculine or feminine? Shraya offers this reason – because we too often deprive ourselves of diverse viewpoints which show us that an alternative is possible. That’s one of the reasons Shraya wrote I’m Afraid of Men. As a racialized, trans, gender-nonconforming woman, she felt compelled to write a book that shared her experiences. My job as the artist is to imagine possibilities, observed Shraya, noting that people are often stuck in the way things have always been done. I’m Afraid of Men is intended to help readers visualize gender identity in a more open and inclusive manner. Vivek Shraya’s story is filled with stark realities and realized possibilities. “My fear was so acute it took me two decades to undo the damage of rejecting my femininity,” says Shraya. But here she is: a powerful stage presence in song and spoken word. I snap a photo of her as the light catches her bindi. During her spoken word performance, Shraya tells us that the saddest part of her night is when she removes her bindi. It’s the last part of herself she sheds, letting the wind catch it from her fingertips. It’s all part of the routine of dressing down into an outfit that won’t risk too much attention. The only time she gets to make choices about how she wants to live or act without judgement is inside the confines of her apartment. That’s when she thinks about how she’ll have to do it all over again tomorrow. And so, Shraya challenges us to widen our lens on gender. She puts forward a challenge for publishers too, underscoring the importance of opening access to trans and queer writers who have important stories to share with a broad audience. Strong female characters and the ordinary lives they lead are at the centre of both Gillian Wigmore and Helen Humphrey’s novels that were discussed at Monday evening’s Character event. In Gillian Wigmore’s novel Glory, the main character Renee is struggling with isolation in a small northern British Columbia town. Helen Humphrey’s novel, Machine Without Horses, features the life of a woman in a remote Scottish location who becomes famous for creating lures for salmon fishing. Location and geography play prominently in both novels, and the relationship of the women to the location was integral to both of them. Wigmore discussed how she wanted to write about women of the North and to address the difficulties they face in the small, isolated towns that whittle away at the character and define them in many ways. “There was a match between the [physical] landscape and the emotional landscape,” said Wigmore. Writing strong characters can be challenging. Humphrey observed that when she first starts to develop a story, she thinks about the motivation of the main character, what they want and what they are driven by. Wigmore said that in writing her book, at one point she thought she was getting too far away from the protagonist, and had to introduce new characters to stay true to her original idea for the main character. Anther common theme of both novels is the walking that the main characters do and that is built into the story. Wigmore said it was a survival tactic for her while living in a small isolated town, and Humphrey admitted that walking is important in both her life and her character’s life. The idea for Humphrey’s novel came from an obituary that a friend had sent her about a famous fly dresser. She was cleaning up her study to get away from the extreme heat one summer day and came across the obituary. “The beginning of a life is often the start of the story,” Humphrey declared, reading from her book. Wigmore said she decided to write her novel since she wanted to explain what a woman in a small northern town faces, especially someone who experiences postpartum depression. She admitted that there were elements of her in the main character, but it wasn’t all based on her. In both novels, the characters are shaped by where they are living. In Glory, the isolated town creates a character who is both independent and resourceful. In Machine without Horses, the main character is resilient since she lives in a small cottage with no electricity or running water. Each author had a different reaction to completing their novels. Humphrey found that she missed her character, and it was hard to let her go. Wigmore, in contrast, claimed that she was happy to say goodbye to some of her characters. Words matter. This is what CBC’s Adrian Harewood reminded the crowd as he opened the evening at Christ Church Cathedral. Considering the tragic events in Pittsburgh earlier that day, Harewood took a moment to reflect on the immense power of language, and the shared responsibility that comes with that power. His message resonated throughout the evening. As he welcomed renowned poet, novelist, and activist Dionne Brand, he admitted he found distance between friends and colleagues difficult. Harewood and Brand have a long history of working together on the literary scene in Canada, and it was this history that shaped the evening, not as an interview, but rather as a moment of reflection between two old friends. Brand began by giving a reading from her latest work of poetry The Blue Clerk. It was evident that Brand’s words resonated heavily with the literary crowd listening on as she declared “I have withheld more than I have written.” This is quite a statement for Brand, who has produced numerous volumes of poetry, several novels, anthologies, and documentaries over in the last forty years. Throughout her career, Brand has used her voice to speak up on matters of political justice, and especially on topics pertaining to gender and race. Brand was awarded the Governor General’s Poetry Award in 1997, and just last year was appointed to the Order of Canada. How can she have left anything unsaid? Her reading questioned this as well: “What is withheld?” As Harewood inquired into the origins of Brand’s latest work, she expanded on this idea, which forms the backbone of her latest volume. Brand explained that “writing is a negotiation between what is written and what is withheld” because it is “too precious, too raw, too embarrassing, too rough, or perhaps unfinished.” Her most recent work imagines these unsaid things as an entity, the blue clerk, who manages the ever-growing inventory of unshared pages and is in constant battle against the author who chooses, from amongst the unsaid things, what is acceptable to share. Brand identifies herself as both characters, a metaphor for the struggle between things said and unsaid. We all have a clerk, Brand explained, who holds things back for any number of reasons. Writing the work, she said, was an exercise in coming closer to truth. This is a thought-invoking confession from an author who once wrote that “no language is neutral” and who has devoted her entire life to speaking up and out about her truth. Even for her, she admitted, the clerk filters, withholds, and worries. The conversation delved deeper into Brand’s relationship with language as she reflected upon the stories her grandmother used to tell her on the veranda after dark. During these conversations, Brand began to recognize words as a powerful tool against ignorance. She described writing as “an act in the world,” after which there will still be ripples and reverberations. In light of how Brand has used her voice over the years to speak for the marginalized, it was moving to hear her explain that at 25, a friend of hers asked her if she believed there would be freedom in their lifetime, and she didn’t even question another answer except for “of course.” Now, some forty years later, Brand confessed that she is not as sure of her answer, but that this makes her all the more vigorous and insistent. When an audience member brought up the notion of black excellence, Brand emphatically asked: “the exercise of exemplary is to prove to whom that we are human? We are simply human.” She argued that in an ordinary society it is important to raise good people, not excellent ones. It is such a simple, yet empowering notion, during such a turbulent time: ordinary people raised to be good and working every day to get closer to their truth. As people collected their things and began to line up to get their books signed, undoubtedly inspired by Brand and Harewood, they must each in turn have heard their "blue clerk" whisper to their “author”: these words are yours - what shall you do with them?